Me and coffee table tray have been through a lot these past years. 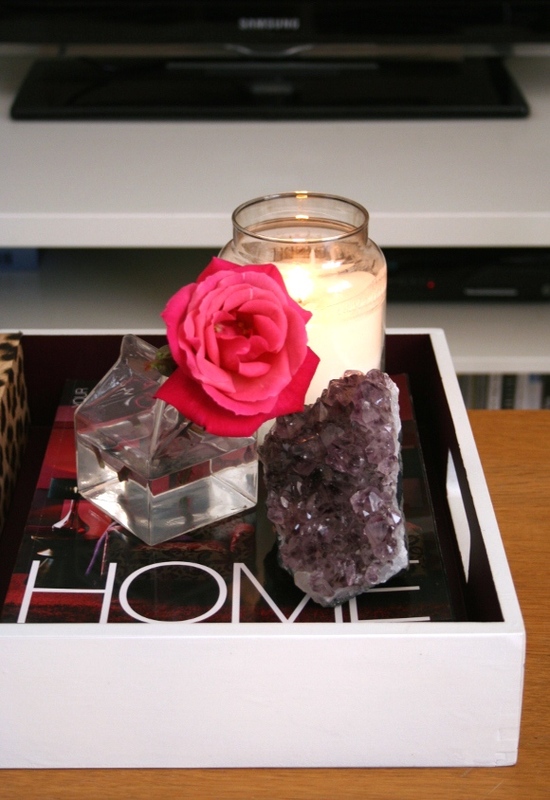 Coffee table tray was originally au naturel. Wood-on-wood was too much meh for one table, so I first painted it light greyish blue. That changed quickly to all Winegum, but since we also had blackboard walls at the time it was all a bit dark, so I spray painted the tray all white. 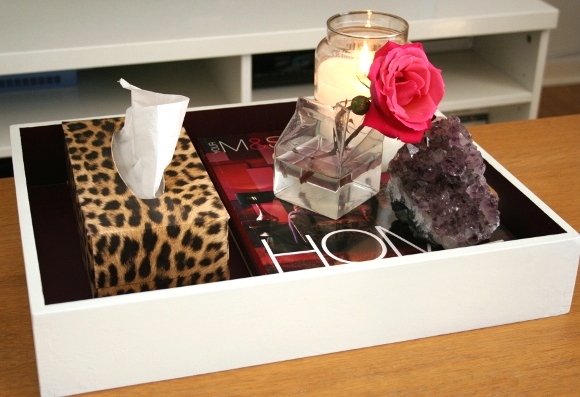 Coffee table tray served us well in white. It was cheery, but if I’m honest, boring as hell. I wanted Winegum back in my life, so this week I thought why not have the best of both? I added Winegum back into the mix, but just to the inside of the tray. And I must say, I think it looks well swank and sophisticated. I simply used masking tape along the top and handles then sprayed the inside. I’m quite happy with this combo so I don’t foresee me attacking poor coffee table tray again for a good while. 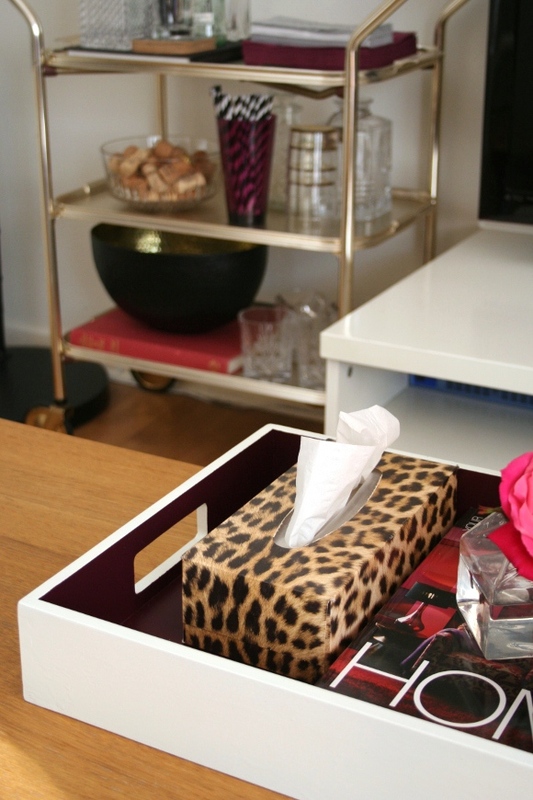 So what about you guys – do you have a particular thing in your home you’re constantly changing? 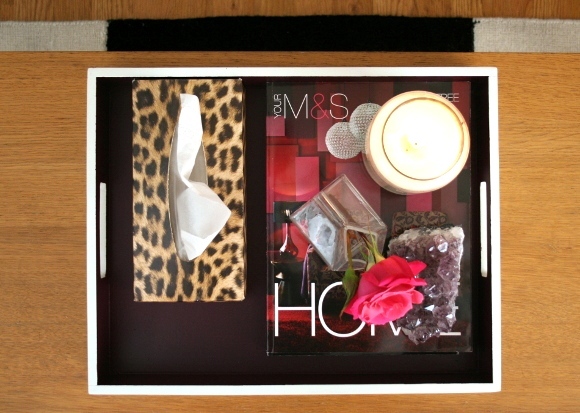 Also featured – charity shop bar cart : my sneaky tissue box trick : glass milk carton. It is gloomy here, but still 18C with humidity taking it up to 24C. If that is only the morning, I expect a very warm muggy day. 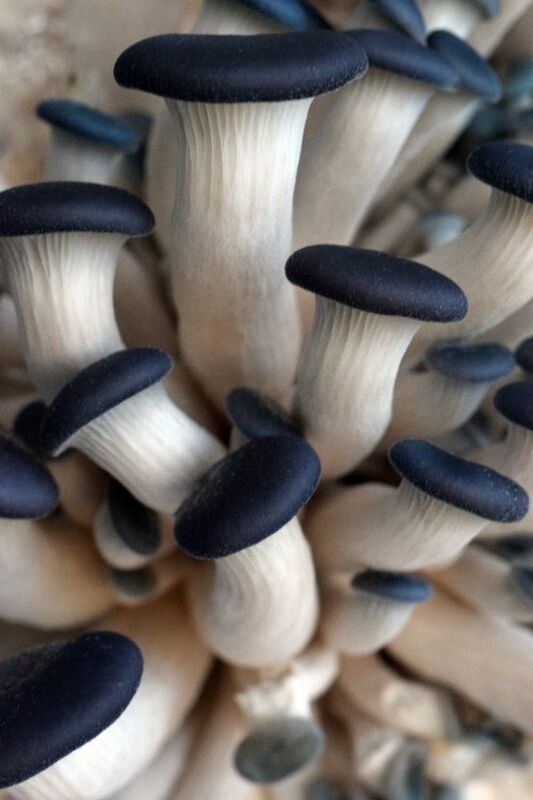 I love going back and forth from your previous posts of your coffee table tray. Like a game! I do agree, this last iteration of it is – by far – the BEST! I really like the little details, like keeping the inside of the handles white. It is pretty sophisticated. Thanks Pat! I am well chuffed with how it looks now, and am content to keep it this way for the foreseeable future. Yes and yes. you've done it again – this looks *SO* good, and i think really designery. you said it – sophisticated! i did what Pat did and went through your previous posts (LOL), and in total agreeance that this one is the best. not to mention your photog skills are a lot better. i mean that in the most complimentary way!! Haha, thanks John. Oh god those old pictures are so cringe. Ughghg. Well, at least there's proof I'm trying to improve. What an eye sore. Another one who looked at the previous editions too. Gosh it was an ugly wooden tray. Amazing what a difference some paint can make. Love this new fresh edition of the tray. Today it's Sunday here in NZ and we have officially hit spring,so exciting!! We have just come through the warmest winter in decades and for that I am grateful 🙂 roll on October cos that's when official BBQ season starts in our household lol. I'll start saving up now Janine, and by then I can make it over to you for spring! Ah, we can sit outside and drink iced tea together. Wait — October is next month — srsly, WTF. Changes might be good, but if it becomes constant then there may be something wrong. Thanks for the post.